The roiling ocean provides a moving muse for artist Jen Rork. 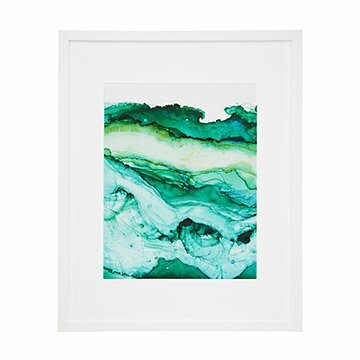 She creates this evocative seascape, along with its companion piece Stormy Seas, on a small scale by mixing drops of alcohol inks on pristine white tiles. She manipulates the pigment using fans, gravity, and by blowing air to create beautiful swirls. She then photographs her miniature masterpieces at the most picturesque moment, and blows up the artworks to enhance every delicate plume and undulation in breathtaking detail. The pieces suggest the surf's dynamic energy at different moments of the day. Printed and framed in Portland, Oregon. I'm going to get this beautiful piece framed. Only drawback was the price of it framed here all in one was significantly more than I can frame it myself, adding an extra step.